Rabbi at Hotzenplotz and Austerlitz in the seventeenth century. 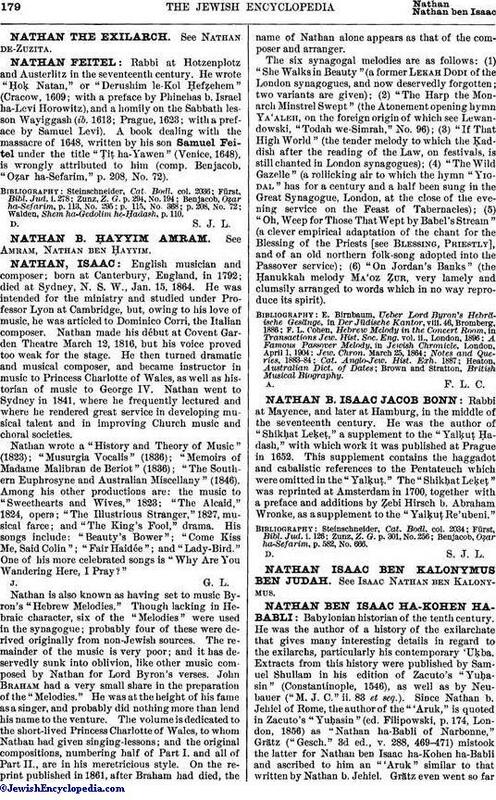 He wrote "Ḥoḳ Natan," or "Derushim le-Kol Ḥefẓehem" (Cracow, 1609; with a preface by Phinehas b. Israel ha-Levi Horowitz), and a homily on the Sabbath lesson Wayiggash (ib. 1613; Prague, 1623; with a preface by Samuel Levi). A book dealing with the massacre of 1648, written by his son Samuel Feitel under the title "Ṭiṭ ha-Yawen" (Venice, 1648), is wrongly attributed to him (comp. Benjacob, "Oẓar ha-Sefarim," p. 208, No. 72). Walden, Shem ha-Gedolim he-Ḥadash, p. 110.